An ambitious Italian effort is underway to re-engineer the auroch, a wild cattle species that’s been considered extinct for nearly four centuries. Likely most familiar to people today from the prehistoric images painted on caves in Lascaux, France, the species holds an almost mythical place in European history. Writing in Gallic War, Julius Caesar described them as “a little below the elephant in size, and of the appearance, color, and shape of a bull. Their strength and speed are extraordinary.” Indeed these ancient giants weighed up to 1,000 kg, were two-metres tall at the shoulder and had massive, scimitar-like horns. The last-known specimen died in Poland in 1627. 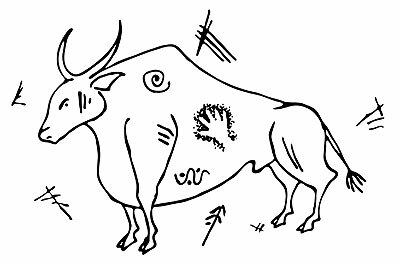 Yet today, scientists from the Consortium for Experimental Biotechnology are working on “back-breeding” existing cattle species to replicate the DNA of the auroch. By selectively breeding species thought to descend from aurochs, including Scottish Highland cattle and the semi-feral Italian Maremma, they hope to reproduce a close approximation – both in appearance and genetics – of the extinct creature. Adding a unique twist to the project, this isn’t the first time scientists have tried to revive this species. Prior to the Second World War, two German zoologists – apparently on Hitler’s direct orders – attempted to do what the Italian team is undertaking, as part of the Nazis’ larger eugenics campaign. Here at home, another bovine back-breeding program has helped ensure the genetic purity of the plains bison herds roaming in Elk Island National Park, Alberta and the Old Man on His Back Prairie and Heritage Conservation Area in Saskatchewan. While if successful, the experiment could lead the way to an entirely new form of species conservation (imagine the tourists flocking to Dodo National Park in Mauritius), the question remains where to house the resurrected beasts, said to have the temperament of a rhinoceros.